Fire Mountain Traffic: Looks like Avocado Rd. is the latest through-street in Phase 1 of traffic calming measures. 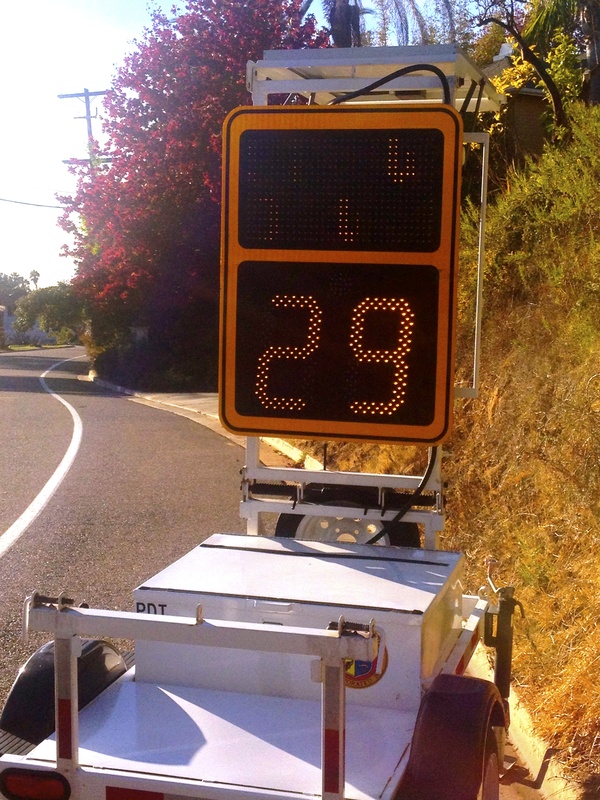 Thanks to the persistence of our neighbors the city has installed a radar trailer on Avocado Rd. and is studying the need for additional measures. Normally Phase 1 consists of “educating the public” and the radar trailer is one way to educate motorists as to how fast they are actually traveling. Our streets become particularly dangerous during the holidays as more people cut through our neighborhood to get to the Wal-Mart shopping center, let’s hope the education process is stepped-up during that time. Changes to Downtown Oceanside: Mission Avenue, between Horne Street and Coast Highway, started it’s update last week and will continue renovations until Summer 2014. Like many more metropolitan downtown areas the main entryway to Oceanside will become a two lane, one-way street. Mission Avenue will be converted to a west-bound only route, while Seagaze Drive, one block south of Mission Avenue, will be converted to a one-way east bound street. Let the confusion begin! For more info visit the City of Oceanside web site. Interstate 5 Expansion Project: The environmental impact report for the $3 billion 27-mile I-5 expansion project has been completed and hundreds of pages are now available here for download. The last public meeting in Oceanside was in 2010. Since that time the agency has heard from more than 5000 people and incorporated their comments into the planning – the improvements are focused on carpools, transit, and express lanes. Highlights of Oceanside area changes include a couple of pocket parks, some sound barriers, The visual simulation looks as if the freeway is really encroaching on the Buena Vista Lagoon and there are major improvements to bike and pedestrian paths along all 27 miles. The incredibly dangerous I5 / 78 Interchange is not a part of this expansion. While there are a couple of changes on the docs, that is a separate project that will move forward independently and supposedly meetings were to be scheduled Summer 2013 (Did we miss those?). According to the web site, the I-5 Express Lanes project is just one component of the planned $6.5 billion North Coast Corridor (NCC) Program, which includes highway, rail, transit, environmental protection and coastal access improvements. Planned improvements such as the I-5 Express Lanes provide flexibility for future for transit services such as Bus Rapid Transit and highway express buses. 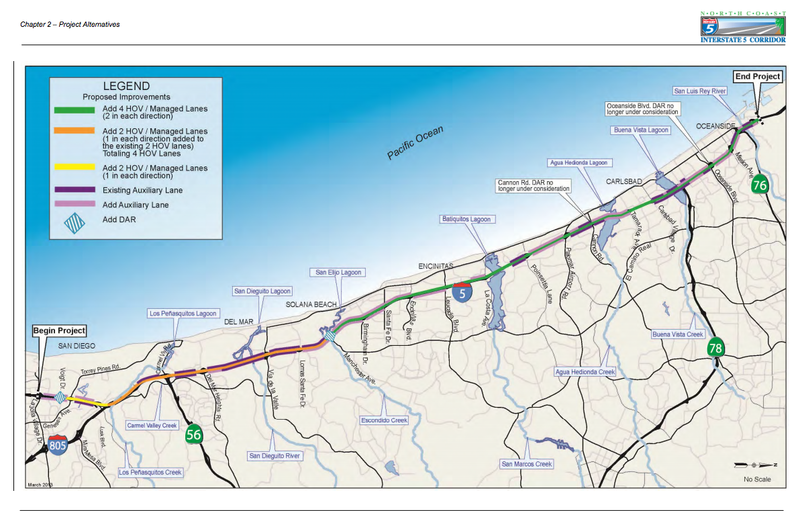 Adding Express Lanes to I-5, double tracking the coastal rail line and improving local and regional bike and pedestrian trails are part of the NCC Program’s system solution to focus on moving people rather than just cars. Categories: Local Info, News | Tags: Construction, Environmental Impact Report, Freeway, I-5, Interstate 5, Oceanside Improvements, Traffic | Permalink.